Description of "18 Enlightening Tales"
‘Storytelling’ has been an important and integral part of Indian Philosophy and schools of thought. Most of our Puranas, Upanishads and other scriptures are filled with such non-fictional memoirs and true stories. 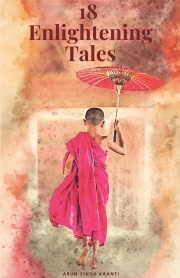 Superficially, they may seem to be simple tales, but deep inside, they have great hidden wisdom and meaning. Ramayana and Mahabharata, for instance, are also true chronicles from the past, that have been enlightening our future for thousands of years. Such is the charm of stories. Like a mother glazes medicines with sweets (Matru-Modakam) to tempt the child into merrily ingesting the bitter, yet life-saving drug, the verses of our shastras (scriptures) too have a concealed divine intention. They give some bitter, but true insights in the form of sweet and interesting tales. This book too contains some stories flavoured with riveting twists, suspense, thrill, emotions, absorbing dialogues, which are analogical to or exact out of some real incidents of life of Arun Singh KRANTI. The underlying mission of these snippets is to enlighten the consciousness of readers. Arun Singh KRANTI is Shishya of Parameshthi Guru Nikhileshwarananda Ji. He is a Writer, Poet, Journalist, Trainer, Kriya Sadhak, Purohit, Sanatan Traveller, Spiritual NLP Life Coach, Vedic Astrologer, Palmist, Himalayan Numerologist, Advanced Scientific Remedial Vastu Expert, Atharva (Spiritual Aura) Healer, Vedic Rituals - Mantra Vidya - Yagya - Rudraksha Therapist, Inspirational Speaker and a Success Mentor. Reviews of "18 Enlightening Tales"
Arun Ji has truly made magic with his words, it’s beautiful. Can’t wait to read more of his books. Great stories. Highly inspiring. Awesome life-lessons. Beautiful Illustrations. A must have motivational book. Suitable for every age-group.